by Chris Woodford. Last updated: December 17, 2018. You can't walk on water: you're too heavy and you'll sink like a stone. But this aircraft carrier can float, even though it's over 300m (1000ft) long, at least a million times heavier than you are, and carries about 70 airplanes and 4000 sailors. Ships (large oceangoing vessels) and boats (smaller ones) are a brilliant example of how science can be put to work to solve a simple problem. Over two thirds of Earth's surface is covered in water so it's just as well that science helps us take to the waves. How exactly do ships do their stuff? Let's take a closer look! Photo: Running 342m (1123ft) from bow to stern, the aircraft carrier USS Enterprise was the longest ship in the world until its retirement in 2013. Despite the huge size of this ship, notice how its bow (front) is quite sharply pointed so it pushes the water aside, creating less resistance and allowing the ship to move faster and more efficiently. Photo by Brooks B. Patton courtesy of US Navy. Not such a silly question! A ship or a boat (we'll call them all boats from now on) is a vehicle that can float and move on the ocean, a river, or some other watery place, either through its own power or using power from the elements (wind, waves, or Sun). Most boats move partly through and partly above water but some (notably hovercraft and hydrofoils) lift up and speed over it while others (submarines and submersibles, which are small submarines) go entirely under it. These sound like quite pedantic distinctions, but they turn out to be very important—as we'll see in a moment. All boats can float, but floating is more complex and confusing than it sounds and it's best discussed through a scientific concept called buoyancy, which is the force that causes floating. Any object will either float or sink in water depending on its density (how much a certain volume of it weighs). If it's more dense than water, it will usually sink; if it's less dense, it will float. It doesn't matter how big or small the object is: a gold ring will sink in water, while a piece of plastic as big as a football field will float. The basic rule is that an object will sink if it weighs more than exactly the same volume of water. But that doesn't really explain why an aircraft carrier (made from dense metal) can float, so let's explore a bit further. Buoyancy is easiest to understand thinking about a submarine. It has diving planes (fins mounted on the side) and ballast tanks that it can fill with water or air to make it rise or fall as it needs to. If its tanks are completely filled with air, it's said to be positively buoyant: the tanks weigh less than an equal volume of water and make the sub float on the surface. If the tanks are partly filled with air, it's possible to make the submarine float at some middle depth of the water without either rising up or sinking down. That's called neutral buoyancy. The other option is to fill the tanks completely with water. In that case, the submarine is negatively buoyant, which means it sinks to the seabed. Find out more about how submarines rise and fall. 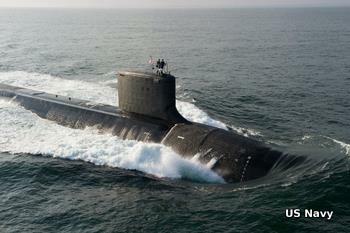 Photo: Submarines can rise to the surface or sink to any chosen depth by controlling their buoyancy. They do so by letting precise amounts of water or air into their ballast tanks. Photo courtesy of US Navy. Now most boats don't operate in quite the same way as submarines. They don't sink, but they don't exactly float either. A boat partly floats and partly sinks according to its own weight and how much weight it carries; the greater the total of these two weights, the lower it sits in the water. There's only so much weight a boat can carry without sinking into the water so much that it... does actually sink completely! For ships to sail safely, we need to know how much weight we can put in or on them without getting anywhere near this point. So how can we figure that out? The person who first worked out the answer was Greek mathematician Archimedes, some time in the third century BCE. According to the popular legend, he'd been given the job of finding out whether a crown made for a king was either solid gold or a cheap fake partly made from a mixture of gold and silver. One version of the story says that he was taking a bath and noticed how the water level rose as he immersed his body. He realized that if he dropped a gold crown into a bath, it would push out or "displace" its own volume of water over the side, effectively giving him an easy way to measure the volume of a very complex object. By weighing the crown, he could then easily work out its density (its mass divided by its volume) and compare it with that of gold. If the density was lower than that of gold, the crown was clearly a fake. Other versions of the story tell it a slightly different way—and many people think the whole tale is probably made up anyway! Later, he came up with the famous law of physics now known as Archimedes' Principle: when something is resting in or on water, it feels an upward (buoyant) force equal to the weight of the water that it pushes aside (or displaces). If an object is completely submerged, this buoyant force, pushing upwards, effectively reduces its weight: it seems to weigh less when it's underwater than it does if it were on dry land. That's why something like a rubber diving brick (one of those bricks you train with in a swimming pool) feels lighter when you pick it up from underwater than when you bring it to the surface and lift it through the air: underwater, you're getting a helping hand from the buoyant force. All this explains why the weight of a ship (and its contents) is usually called its displacement: if the ocean were a bowl of water filled right to the brim, a ship's displacement is the weight of water that would spill over the edge when the ship were launched. The USS Enterprise in our top photo has a displacement of about 75,000 tons unloaded or 95,000 tons with a full load, when it sits somewhat lower in the water. Because freshwater is less dense than saltwater, the same ship will sit lower in a river (or an estuary—which has a mixture of freshwater and saltwater) than in the sea. If the boat weighs less than the maximum volume of water it could ever push aside (displace), it floats. But it sinks into the water until its weight and the upthrust exactly balance. The more load you add to a boat, the more it weighs, and the further it will have to sink for the upthrust to balance its weight. Why? 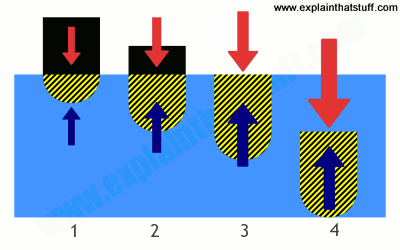 Because the pressure of water increases with depth: the further into the water the boat sinks, without actually submerging, the more upthrust is created. If the boat keeps on sinking until it disappears, it means it cannot produce enough upthrust. In other words, if the boat weighs more than the total volume of water it can push aside (displaces), it sinks. To get the idea of upthrust clear in your mind, think about what happens as you load a ship. With no load onboard, the ship sinks into the water by a certain amount. The amount of water it displaces (shaded area) weighs as much as the ship. The weight of the ship pulling down (red arrow) and the upthrust pushing up (blue arrow) are equal and opposite forces, so the ship floats. Now what if we start loading the ship? It sinks down further, displacing more water (bigger shaded area). The weight of the ship and its load pulling down (red arrow) and the upthrust pushing up (blue arrow) are still equal, but now both are bigger. Suppose we load the ship a bit more so that it just sinks beneath the surface but continues to float. Again, the weight pulling down and the upthrust pushing up are equal, even though both are bigger. But at this critical point, the ship is displacing as much water as it possibly can, so the upthrust cannot get any bigger. We didn't like the ship much anyway, so let's add a lead weight on top (a weight that's dense enough to sink all by itself). No matter how much weight we add, the ship cannot produce any more upthrust: once it's completely submerged, whatever depth it sinks to, it can only ever displace a certain amount of water and create a certain amount of upthrust. Now the weight of the ship is more than the maximum possible upthrust so it sinks to the bottom. Suppose we attached a giant weighing machine to the top of the ship at this point. The apparent weight of the ship plus its cargo would be much less than expected, by an amount equal to the weight of the displaced water (the size of the upthrust). In other words, if we wanted to raise the ship to the surface from the seabed, we'd need to use a lifting force equal to the difference between the weight and the upthrust (the red arrow minus the blue arrow). How do we know that the upthrust on something is equal to the weight of fluid it displaces? If you can bear a little bit of math, it's very easy to prove! We need to know two general bits of physics to do it. First, that pressure is defined as force per unit area (force divided by area), so the force on a given surface of the box is the pressure times the area of that surface. Second, that the pressure (P) at a given depth (h) in a fluid is equal to the depth times the density (ρ) times g (the acceleration due to gravity). 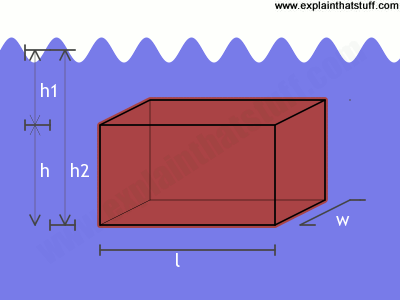 Or P = h × ρ × g.
Now take a look at this submerged box. How big is the upthrust? The water pressure at the top of the box is h1 × ρ × g while the pressure at the bottom is h2 × ρ × g. The difference in pressure is (h2−h1) × ρ × g = h × ρ × g.
But because (h × w × l) is the volume of the box, and ρ is its density (or its mass per unit volume), that's the same as saying the difference in force is equal to m × g, where m is the mass of the box. m × g is another way of writing the weight of the box. So we've very quickly proved that the upthrust is equal to the weight of the fluid the box displaces. In other words, the more fluid the box displaces (the bigger the box), the bigger the upthrust. And that's why bigger boats—ones spread out wider, to occupy more volume—can carry more stuff. If you still find the idea of upthrust a bit confusing, just go back to thinking about density. Imagine if the aircraft carrier were a giant metal box of the same volume (like a big shoe box), partly filled with engines, airplanes, sailors, and everything else—so it weighs just as much. That box would float if it weighed less than a box the same size filled with water; otherwise it would sink. So, in short, an aircraft carrier floats because it weighs less than the same volume of water—because its average density is less than that of the water that surrounds it. Photo: The simplest way of understanding why things float is to forget about Archimedes and think instead about density. A ship floats because its average density is relatively small. 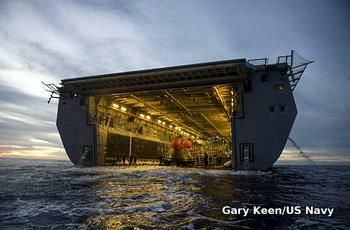 This empty military transport ship is effectively a giant empty metal box. Divide its total mass (its own mass plus that of its contents) by its volume and you get its average density. That's less than the density of a solid metal box or a metal box filled with water, and that's why the ship floats. Photo by Gary Keen courtesy of US Navy. If you've ever climbed onto a rowboat tied to a jetty, you'll have a sense of how very unstable small boats can be when you start to load them. When you stand in a boat, you effectively become a part of it, so you alter its center of gravity, instantly making it much higher up. Since you enter a boat from the side, the minute you step onboard, you shift the center of gravity over toward the place where you're standing. Now the center of gravity is no longer above the center of the boat, and that makes the whole thing rotate toward you. A boat can swing from side to side relatively freely; because it's positively buoyant, it takes only a small force to make it move in the water. All these things combined make a small boat relatively easy to capsize (rotate onto its side and often sink). By sitting down in a small boat, you lower the center of gravity and make it more stable. Photo: Small boats can be quite unstable, even with a keel. The strong wind could capsize this boat, which is why the crew are all sitting along the edge to balance the turning force with their own weight. Photo by Chad Runge courtesy of US Navy. Bigger boats don't suffer from this problem. First, they tend to have heavy metal engines very low down beneath the water level, which gives them a low center of gravity and makes them more stable. Second, they have a bigger keel (a vertical board running underwater, from back to front, along the central "spine" beneath the boat. The keel helps to stop a boat rolling (moving from side to side) or capsizing, because it means more force is required to push the boat sideways through the water or rotate it. The keel also plays a part in steering and propelling the boat, as we'll see shortly. Gravity is the force we have to work against when we walk on land. But if you're a keen swimmer, you'll know it's not really an issue when you move on water because your body is relatively buoyant: even though your body is mostly water, it's not all water (it weighs less than a bag of water exactly the same size). Water resistance (drag) is by far the biggest force swimmers have to work against—and that's also true of boats. The more weight a boat carries, the lower it sits in the water and the more water resistance it creates. That's why boats have sharp narrow bows (to push water cleanly out of the way) and curved front edges that plane (lift them up out of the water as they move along). Hydrofoils push this idea to the limit by using underwater wings to lift their hulls up and clear of the water as they move along. Photo: A hydrofoil is a type of boat that uses underwater wings to generate lift as it speeds forward, raising the hull above the waves to reduce water resistance. Photo by Mark S. Kettenhofen courtesy of US Navy. Like most other objects, boats propel themselves by harnessing Newton's three laws of motion: 1) They don't go anywhere unless a force of some kind pushes or pulls them; 2) When there is a suitable force, it makes them accelerate (move faster or in a new direction) and a bigger force will accelerate them more; 3) If a boat wants to go forward, it has to apply a backward-pushing force—just as you have to kick back with a skateboard to shoot off down the sidewalk (or push back with your legs to walk forward). Most boats use one of three different kinds of power: oars or poles, sails, and engines. Photo: Human power remains a dependable way to power a boat, but unless you have an equal number of oars on both sides (or keep swapping sides), you'll move to one side more than the other. 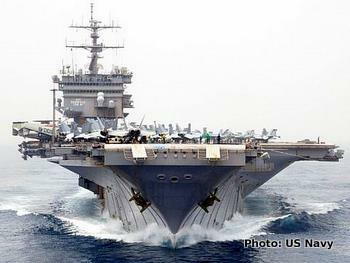 Photo by Clay Weis courtesy of US Navy. The oldest form of boat propulsion is simple human power. You can row a boat by pulling the water backward with large paddles or you can punt something like a raft forward by pushing off against a river or seabed. Oar-power reached its pinnacle with the amazing galleys developed in Greek and Roman times. Biremes (perhaps dating from the second millennium BCE) had two platforms packed with rowers, while triremes (invented a few hundred years BCE) had three, quadriremes had four, and quinquiremes five (although it's uncertain whether boats with so many people packed in, at such height, would have been either stable or efficient). In any case, they soon gave way to sail power. 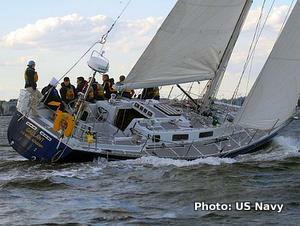 Photo: Yachts have multiple sails so they can catch the wind from any direction. Photo by Eric Brown courtesy of US Navy. If you want to sail into a wind, you need to use a triangular or lateen sail hung at the front of your boat at an angle to the oncoming wind. As the wind hits the sail, it blows around it and accelerates; the sail acts in a similar way to an airfoil (the curved surface of an airplane wing), throwing air around and behind it and pushing the boat forward (just as the downward air from a wing propels a plane upward). Not all engine-powered boats use propellers. Jet Skis® and jetfoils (large, hydrofoil versions of jetskis) use engines to power impellers (water pumps) that create a powerful backwater-pointing jet of water. The force of the water shooting back into the water powers the boat forward, much like the hot exhaust gas from a jet engine. What materials are boats made from? Just about every material you can think of has been used to make boats at one time or another. The first boats were made from animal skin, bark, and wood; later came dugouts made by scooping the wood from a carefully chosen tree trunk. In ancient times, boatbuilders perfected the art of building boats up from separate planks, either by fixing the edges of one plank to the edges of those around it like bricks in a wall (which is known as carvel building) or, better still, by overlapping the planks from the bottom upward (a technique known as clinker building), which makes for a stronger, lighter, and faster boat. The Industrial Revolution brought another great innovation: the age of mighty iron and steel ships. Most modern ships are still built from steel today, although it's relatively heavy. That's why some larger boats are now made from strong, lightweight metals such as aluminum, while smaller ones are often made from light composites such as fiberglass or super-strong plastics like Kevlar®. 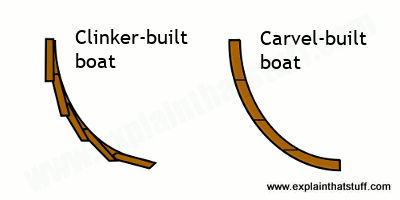 Artwork: Clinker-built boats (left) have overlapping planks, which gives a much stronger hull; carvel-built boats (right) have the planks joined end to end to form a smooth outer surface. The links in this timeline will generally take you to further information in Wikipedia and other sites. ~10,000BCE: First boats include rafts, skin, hide and bark boats, kayaks, and dugouts. ~5000BCE–3000BCE: Mesopotamian sailors invent sails. ~3000BCE: Ancient Egyptians make the first boats from wooden planks. ~2500BCE: Minoans and Mycenaeans become the first great ocean navigators, exploring the Mediterranean sea. ~1500BCE–27BCE: Greeks build giant warships, including biremes and triremes. 27BCE–400CE: Romans build galleys, the ancient ancestors of modern warships, with innovations including a raised bridge. ~300BCE: Archimedes (287–212BCE) figures out the science of floatation. 200CE: Lateen sails are being widely used in the Mediterranean (though they are believed to have been invented somewhat earlier in the Arab world). 300: Vikings invent clinker building. 1200: The central rudder starts to replace the "steerboard." 1400–1600: Most large ships are wooden-built and sail powered, and include cogs, carracks, galleys, and galleons. 1620: Cornelis Drebble builds the first submarine from wood. 15th century: Great voyages by Christopher Columbus (1451–1506), Vasco da Gama (1460–1524), Ferdinand Magellan (1480–1521), and others pioneer ocean exploration and circumnavigation. 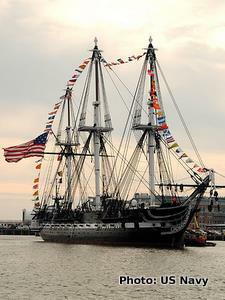 Photo: The USS Constitution, nicknamed "Old Ironsides," is a classic, three-masted frigate (warship) dating from 1797. Long since retired from military duty, it's now a fascinating museum in Boston. Photo by Kathryn E. Macdonald courtesy of US Navy. 1777: First iron-hulled boat is built (in England). 1783: Marquis d'Abbans (1751–1832) builds the first steamboat. 19th century: Regular "packet shipping" services are established, sailing to timetables. Fast clipper ships set sailing records. 1807: Robert Fulton (1765–1815) sets a record for traveling from New York City to Albany with a steamboat called Clermont. 1819: Steamboat SS Savannah crosses the Atlantic in a record 29 days. 1836: Modern propellers are invented (independently) by Francis Pettit Smith (1808–1874) and John Ericsson (1803–1889). 1837: Great Western, a giant steam-powered ship called built by Isambard Kingdom Brunel (1806–1859) becomes the first iron boat to cross the Atlantic. 1850s: English shipbuilder John Jordan makes probably the first composite ship by adding wooden-plank cladding over an iron framework. 1870-1898: John Holland designs and builds the first practical, engine-powered submarine, but struggles to convince the US Navy of its potential. 1877: English inventor John Thornycroft patents an early form of the hovercraft based on a floating lily pad. 1884: Sir Charles Parsons invents a highly efficient steam engine called the steam turbine. In 1897, he develops a steam-turbine-powered motor launch called Turbinia. 1886: German auto pioneer Gottlieb Daimler uses a gasoline engine to power a boat. 1886: Gluckauf, one of the first ocean-going tankers, is built and launched in Britain. 1880: Retired Swedish naval officer Charles G. Lundborg invents SWATH (small waterplane area twin hull) boats that ride high above the waves on two submerged hulls. ~1900s: Wealthy people enjoy the romantic, luxurious age of ocean travel onboard liners such as the Mauretania, Lusitania, and Aquitania. 1906: Enrico Forlanini invents the hydrofoil. Telephone pioneer Alexander Graham Bell also plays a part in its development. 1912: A "practically unsinkable" luxury liner called Titanic secures a place in history as the most famous ocean catastrophe of all time when it hits an iceberg and sinks, killing over 1500 people. 1930s: Germans develop the snorkel, a breathing tube that allows diesel engines in submarines to operate underwater, reducing the risk of detection. 1943: Marine gas turbine engines are used for the first time. 1955: US Navy launches first nuclear-powered submarine, USS Nautilus. 1956: Ideal X, the first container ship, is launched from Newark, NJ. 1959: Christopher Cockerell's hovercraft makes its maiden voyage. 1960: Jacques Piccard and Lt. Don Walsh of the US Navy dive to around 11km (6 miles) in the deepest part of the oceans, the Mariana Trench, in Trieste, a super-reinforced diving vessel (bathyscaphe). 1962: Scripps Institution's FLIP ship is first used to study the movement of ocean waves. 1964: A deep-diving scientific submersible called Alvin is developed by Woods Hole Oceanographic Institution in Massachusetts and begins exploring the ocean to depths of almost 5km (3 miles). 1978: Scientific exploration vessel JOIDES Resolution is launched, allowing scientists to explore the seabed in more detail than ever before. 1992: US Navy scraps the last of its giant battleships, USS Missouri. 1993: US Navy launches an experimental, radar-invisible stealth boat called the Sea Shadow, based on a SWATH design. 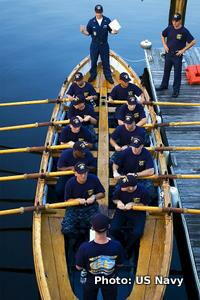 In 2011, the Navy announces it intends to scrap the vessel. 2012: The German-built MS Tûranor PlanetSolar becomes the first vehicle powered by photovoltaic solar cells to circumnavigate the world. 2014: The Norled MF Ampere, the world's first fully electric, battery-powered car and passenger ferry, begins operating in Norway, and saving one million liters of diesel per year. Ship by Brian Lavery. DK, 2017. A detailed, well-illustrated guide to the last 5000 years of maritime history. Ocean Ships by Allan Ryszka-Onions. Ian Allen, 2016. A detailed catalog of ocean-going ships currently working our seas. The focus is mostly on cargo and tanker ships, with a handful of cruise liners thrown in for good measure. The Great Passenger Ships of the World by Raoul Fiebig et al. Koehlers, 2016. A comprehensive guide to the world's cruise liners and other passenger ships. The History of the Ship by Richard Woodman. Conway Maritime Press, 2012. A very readable, accessible history that takes us from ancient times all the way to modern container shipping. Know Your Boat: The Guide to Everything That Makes Your Boat Work by David Kroenke. McGraw-Hill Professional, 2002. A practical guide for boat owners. How Boat Things Work: An Illustrated Guide by Charlie Wing. 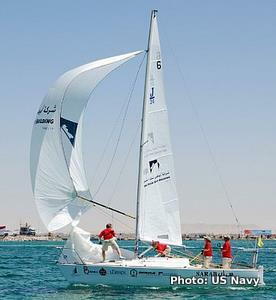 International Marine, 2007. A practical DIY guide to the nitty gritty of how small powerboats and sailing boats work, covering such things as engines, propellers, compasses, sails, and rigging. First Book of Ships and Boats by Isabel Thomas. A &C Black, 2014. A 48-page introduction that covers each different type of boat in turn, with simply labeled illustrations (so you can compare their different functions and features). Ages 6–9. Why do Ships Float? by Susan Markowitz Meredith. Infobase/Chelsea House, 2010. A good little (32-page) introduction to the most basic question about ships, but also covering submarines, military ships, and related topics. Ages 8–10. Ships and Submarines by Chris Woodford. Facts on File, 2004. My own guide to the history of ship technology runs through chronologically from ancient times to the latest technologies. Although designed for ages 9–12, it's actually written at the same, general sort of level as this article and will be of interest to older readers too. Lots of photos and illustrations. Ships by Chris Oxlade. Lorenz, 1999. A very simple 64-page introduction with 16 projects for children to try. Ages 9–12. The Usborne Book of Cutaway Boats by Christopher Maynard. Usborne, 1996. An old but nevertheless wonderful introduction for ages 9–12 (relatively easy to find secondhand, if not new).